The aroma is complex, with dominant brown sugar and caramel followed by hints of berries. The body is creamy, round, and juicy, creating a desirable mouth-feel. Peach, nectarine, passion fruit, and orange citrus are easily defined in an acidity that doesn't overwhelm the palate. Sweetness is slightly restrained, coming across as light brown sugar and bourbon. There is a delicate floral complexity, crossing into black tea and sweet herbs at times. Aftertaste quickly fades from the palate, but showcases citrus peel, toffee, and cocoa before it is gone. We are a fledgling coffee roaster retail/wholesaler based in Long Beach, California. We've been doing wholesale for around 5 years and we just finished our first year as a retailer. We offer bike delivery to the greater Long Beach area. We are a small group of people in love with our city and fascinated by what coffee can do. We try to walk a line between accessible and exhilarating- between rugged and refined. Categories: Coffee Ratings. Origins: Ecuador. Flavors: Brown Sugar, Caramel, Nectarine, Orange, Passion Fruit, and Peach. Brew Descriptors: Juicy, Mellow, and Sweet. 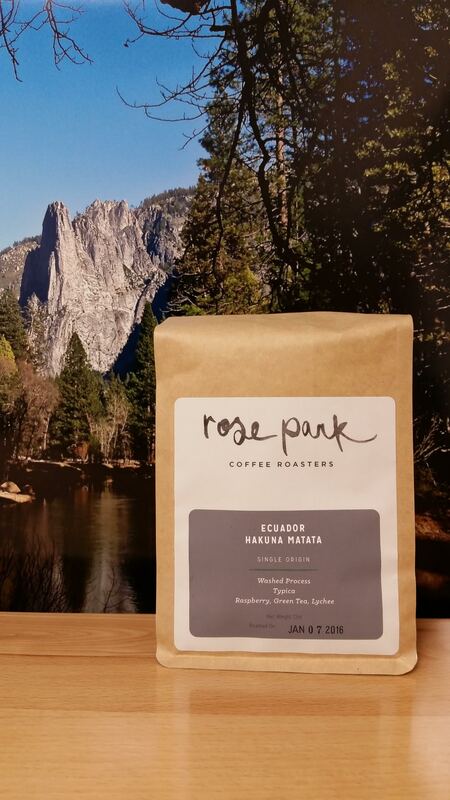 Roasters: Rose Park Roasters.